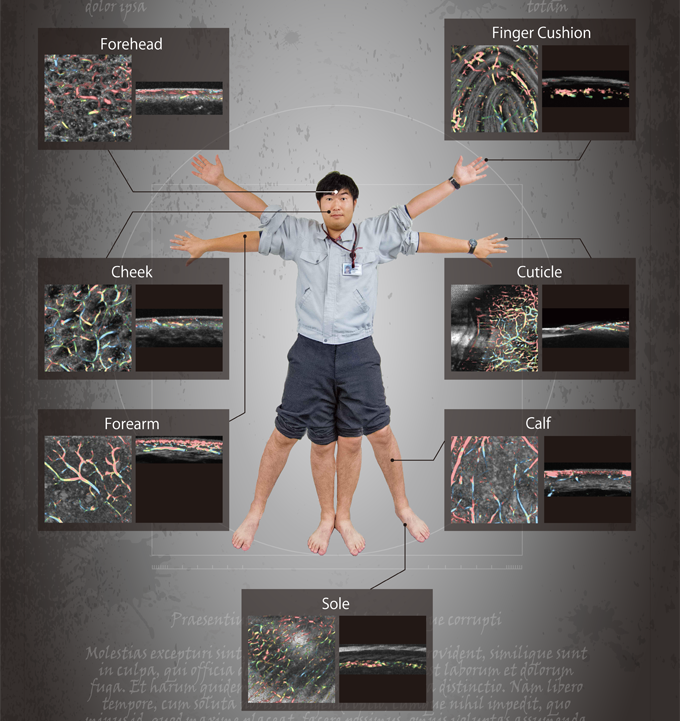 "Hadatomo™ Z" is able to display 3D images of the vascular network by determining blood vessel structures with photoacoustic waves and dermis structures with ultrasonic waves. A single system enables measurement with a dual-wavelength photoacoustic wave method, to distinguish arteries and veins by oxygen saturation, and an ultrasonic wave method, to visualize dermis structure by measuring differences in hardness of components. The photoacoustic wave images and the ultrasonic wave images are measured simultaneously, with a minimum measurement time of 40 seconds (Range: 6 mm x 3 mm x 3 mm (depth)) and maximum time of 210 seconds (Range: 6 mm x 6 mm x 3 mm (depth)). An ultrasonic sensor developed especially for this system provides a high-resolution crosssection view. Focus points can be easily located by observing the cross-section. The compactly designed system, equipped with a measurement unit mounted on a flexible arm, is installed on a system unit with caster wheels, easy to set up to measure various parts of the body. Applying a small amount of water to the measurement area is enough for measurement. Non-invasive measurement is possible without any contrast agent. Measurement data are displayed as 2-dimensional cross-section images in real-time, and acquisition of 3-dimensional data images is possible. 3-dimensional image analysis is possible with customer-provided rendering software. Specifications may change without notification. This product is categorized as a Scientific Instrument. It is not approved for use in diagnosis of diseases. 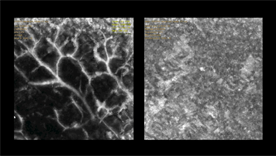 Existing ultrasound technology can noninvasively provide images of tissue structures by contrasting the relative hardness of constituent areas. However, it is inadequate to image areas within the dermis, where little hardness contrast exists. 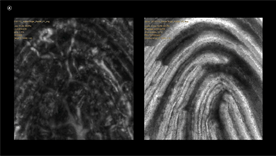 Conversely, optical imaging tools such as microscopes cannot "see" even 1mm beneath the skin. Photoacoustic imaging combines the propagation characteristics of ultrasound and the absorption characteristics of light into a next-generation hybrid imaging method that is used for R&D worldwide. When pulses of light are irradiated into the target area, hemoglobin selectively absorbs their energy and returns ultrasonic waves to the surface of the skin, where they can be captured by sensors at the surface. Based on how long it takes for the waves to return, the depth of the target can be accurately measured and imaged.